Investigation season is here. The House Oversight and Reform Committee announced Michael Cohen, the president’s former lawyer, will testify publicly on Feb. 7, which will be followed the next day in the House Judiciary Committee by public testimony from acting Attorney General Matthew Whitaker. The hearings may not include any bombshells about the content of the Russia investigation, since House Intelligence Committee Chairman Adam Schiff said they hope to discuss that topic in closed-door testimony with Cohen. But it still will be an early test of how effectively House Democrats can marshal their newfound investigative abilities — a power that has significantly weakened previous presidencies but is not without risks. At their core, congressional investigations are a form of political theater, which means their success won’t just depend on what Democrats find but how they present it. There is evidence that congressional investigations can erode presidential support, especially when the government is divided like it is now, but if hearings are unfocused, too technical or appear petty, they can either be ignored by the media or dismissed by the president and his supporters as partisan “harassment.” Congressional investigations can be an extremely powerful tool in a divided government — but only if the investigations make a clear, coherent case for executive branch wrongdoing. It is, of course, impossible to predict exactly what Democrats will uncover in a hearing like Cohen’s or in their potentially numerous other investigations, but we do know two things from studies on previous congressional investigations. First, House investigations have tended to be concentrated during periods of divided government. And second, this increased activity or “weaponization” of the congressional investigation process can weaken the president significantly in the public’s eye. In their analysis, Kriner and Schickler modeled the relationship between presidential approval ratings and investigative activity in both the House and the Senate, controlling for external factors that may affect views of the president, such as the state of the economy, American military action or protests and other domestic conflicts, and focused specifically on the number of days there were investigative hearings within a particular month.3 (They also found that presidential approval can affect Congress’s willingness to investigate the executive branch in the first place.) 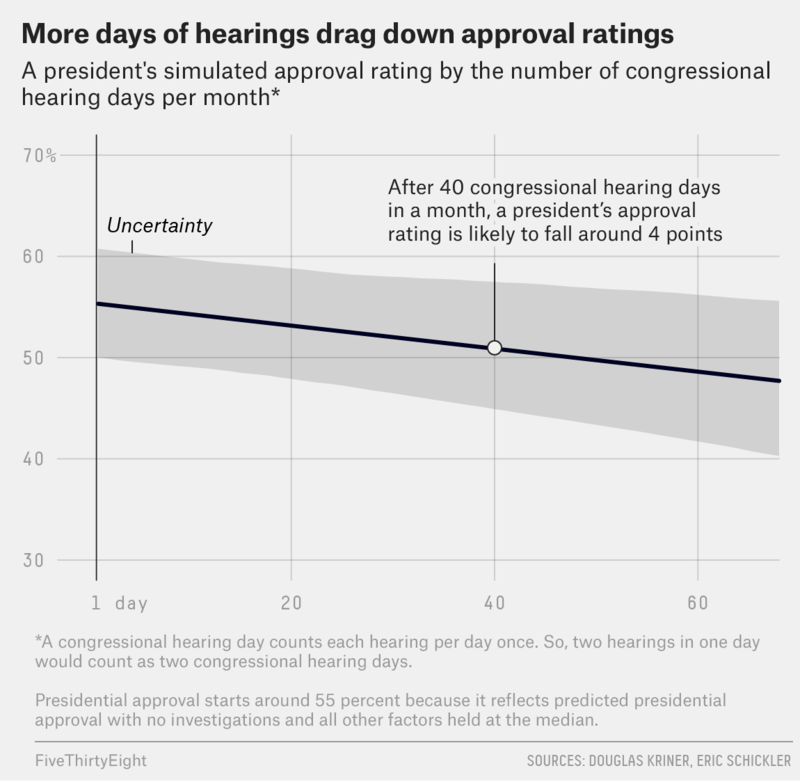 They found that according to the model, 20 days of investigative hearings in a month causes an approximately 2.5-percentage point drop in presidential approval, even accounting for the effect that approval can have on Congress’s eagerness to investigate. Long investigations that unfolded over several months were likely to damage the president, such as during Congress’s investigations into President Ronald Reagan’s role in the Iran-Contra scandal, which involved illegal arms sales to Iran. The investigations didn’t ultimately implicate the president in wrongdoing, but they significantly weakened him during the last two years of his presidency. Similarly, when Democrats won the House in 2006, they opened a broad range of investigations against President George W. Bush, including probes related to the Iraq War, which also eroded Bush’s public support. And it’s not just a president’s approval rating that’s at stake. Kriner and Schickler also found that of 30 major investigations,4 80 percent resulted either in legislation or some kind of concession from the administration. For example, investigations of alleged campaign finance abuses by the 1996 Clinton-Gore campaign paved the way, at least in part, for the sweeping campaign finance reforms passed in 2002, and investigations of political manipulation of a toxic-waste-clean-up fund forced Reagan to replace his EPA administrator with a more liberal appointee. As Congress has grown more polarized, though, it’s become increasingly difficult for investigations to lead to tangible changes in policy. But it’s still possible that Democrats’ investigations will result in some kind of legislative action, like additional sanctions against Russia. That said, Kriner told me Democrats were probably better off trying to inflict political damage through hearings that highlight potential abuse or corruption within the Trump administration than pursuing specific policy goals that may founder in a divided and deeply polarized Congress. This is not to say Democrats can simply hold a slew of hearings and expect Trump’s approval ratings to plummet. Instead, Kriner and other political scientists told me Democrats should think of themselves as storytellers as well as fact-finders. “The most effective uses of congressional investigatory power tend to pick a narrative and reinforce that narrative over and over again,” said Josh Chafetz, a law professor at Cornell University who studies Congress’s relationship with the president. Such congressional investigations under divided government sometimes fail to persuade the public when the House’s motives appear to be merely partisan. So Democrats will have to be careful to avoid being seen as putting on a show for their own supporters. “If they want what they’re doing to seem legitimate, the Democrats can’t just nebulously say they’re investigating Trump’s finances and then go digging to find something that might be damaging,” said Lance Cole, a law professor at Penn State Dickinson Law who was also deputy special counsel for the Democrats on the Whitewater committee. In the current Congress, an aide on the House Oversight Committee told me the committee is trying to follow established processes, such as formally requesting documents or testimony before issuing a subpoena, and work across the aisle. “It’s going to be challenging in this political environment, but one of the big goals is to listen to the other side and have a debate about substance rather than intentions and partisanship,” the aide said. The committee, the aide added, is not just focusing on misconduct by the Trump administration; the first Oversight hearing in the new Congress will probe prescription drug prices. But it may be difficult to direct media attention toward lower-profile investigations, especially when hearings that relate to potentially serious presidential or executive branch misconduct are on the horizon. There is also an argument for starting off slowly, at least when it comes to high-profile investigations of the president, because the media cycle is so easily saturated. Schickler said several of the House Republicans’ investigations of the Obama administration, like their probe into the failed energy company Solyndra, illustrated the importance of serious, sustained news coverage. “This was supposed to be a big scandal, but it never really landed,” Schickler said. “That was in part because it got covered on Fox News, but the mainstream media didn’t really take it seriously.” The House Republicans’ investigations of the 2012 attack on the U.S. diplomatic mission in Benghazi, on the other hand, did get widespread media coverage, according to an analysis by Kriner and Schickler — and although it wasn’t as damaging to Barack Obama as the Republicans might have hoped, it did help shape views about Hillary Clinton. In this context, holding the first two high-profile hearings involving the Trump administration on back-to-back days is a potential misstep, if the two events cannibalize media coverage from each other. “There is some risk here of stepping on each other’s headlines,” Schickler said. But perhaps the biggest unknown — and therefore one of the most important challenges for the Democrats — is how much, if any, of this conventional wisdom will apply in the current political context. For one thing, Trump’s approval rating is lower than many of his predecessors’ at the same point in their term; it’s also been fairly stable, which suggests voters may be less easily persuaded to abandon him. On the other hand, the experts I spoke with were hard-pressed to think of another example of when an incoming House majority had so many different avenues for investigating a president and his administration. “It’s rare to have such an immense array of potential investigations or targets, so in some ways this political moment might be unique,” Schickler said. He also pointed out that Democrats face significant pressure from their supporters to hold the president accountable. So while it’s important for the Democrats to appear reasonable, they could also be punished by their own base if they seem too cautious or slow to move. If all of this sounds like a difficult task, you’re right. Conducting investigations that tell a compelling story, unearth new facts and and appear neutral enough to break through the entrenched polarization of the Trump era would be no small feat. But Trump has also handed Democrats an unusual amount of ammunition. Next month’s hearings will give us our first glimpse of what they plan to do with it. Kriner and Schickler measured the number of days of investigations, rather than the total number of investigations, because determining what constituted a discrete investigation was too subjective. They also found that the number of days better captured the intensity of investigative activity. A congressional hearing day counts each hearing per day once. So, two hearings in one day count as two congressional hearing days. The number of days of investigations in the Senate did not vary as much. They focused on investigations that involved some figure or entity within the executive branch and involved allegations of abuse or misconduct, rather than routine oversight. The investigations were based on political scientist David Mayhew’s list of important investigations, which was most recently updated through 2002; they were “major” because they appeared on the front page of the New York Times at least 20 times.